In this short tutorial, I’ll explain how to take a screenshot on MT4. 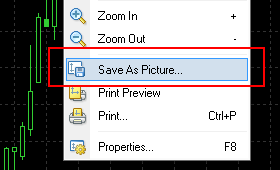 By following these simple steps you’ll be able to save an MT4 screenshot or convert any MT4 chart into an image file. You want to report a problem with the FxMagnetic MT4 indicator. You want to report a problem with any Expert Advisor or Indicator. Technical support will appreciate the screenshot because in most cases it helps a lot. You want to share your MT4 chart with a friend. You want to post your MT4 chart on the Forex Factory or some other place online. So let’s begin and create an image of your MT4 terminal. A window will appear asking you what type of image you would like to save. 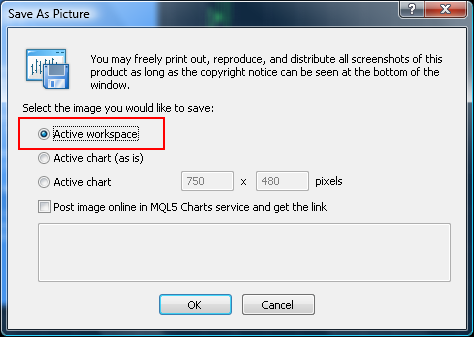 Choose “Active workspace” and click OK.
Additionally, you can select “Post image online in MQL5…” so that your image would be uploaded to MQL5 server and you get a special link. In this case, you can use the link provided to share the image instead of sending the image file. 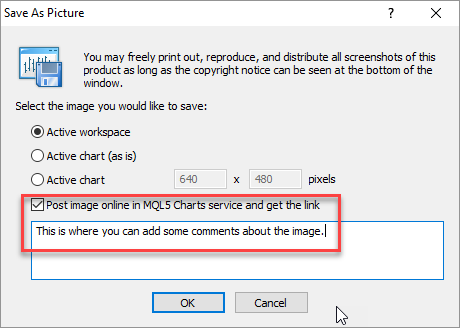 The image immediately is uploaded to the MQL5 Charts service and loaded in your web-browser like FireFox or Chrome. If you scroll down to the bottom of this web-page you’ll see your comment and also several different ways to share this image. Also, there’s an option to delete the image.